Harmonia is a 3 bedroom Premier Villa in the southern coast of Crete, Greece. The area is widely acclaimed as one the best areas in Crete, not as developed as the northern coast. This area is a mix of unspoilt, protected nature, soft valleys looking over the sea and the mountains at their back. Villa Harmonia is set away from other villas allowing guests privacy and peace. The villa is large, open and welcoming at the same time. With its swimming pool (a fold-away fence is available for children safety), well groomed lawns and covered terraces, with a stone-built BBQ, makes entertaining in the hot summer days and evenings ideal. A choice of sandy beaches are just minutes away (1.5 k) or, for the more active, hiking and cycling can start right outside the front door. For those who love history and sight-seeing, the options are endless. Plenty restaurants, bars, shops are only minutes away in the close by village. Villa Harmonia is located on the south coast of Crete in the village of Pitsidia, near Matala. 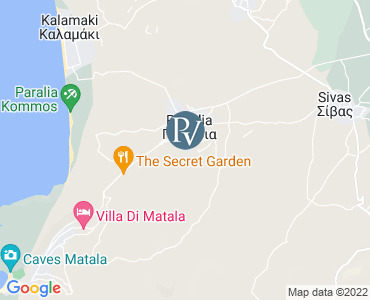 There are restaurants, bars, a supermarket, a bakery, a hairdresser, a bookshop, souvenir shops, car rentals, boat rentals, bicycle rentals and many other services in the neighbourhood of the villa. The nearest and most beautiful beach is Komos Beach (1.5 Km. ), But there are many other beaches nearby such as Matala, Red Beach and Kalamaki. The surrounding picturesque villages have churches, monasteries, muses, shops and restaurants worth a visit. Everything is possible in South Crete where the Psiloritis Mountains meet the white beaches of the Lybian Sea and where the sunsets are unforgettable. A safe natural harbour on the Bay of Messara, blessed with a gently sweeping sand and pebble beach, Matala is the place in legend where Zeus swam ashore in the guise of a bull with Europa on his back. Many people make this village their base for Cretan holidays, as it is so central on the south coast, and away from the over-development of the north coast. The beach is 250m long and 45m wide. At the beach there are sport facilities as well as activities for children, and if you would like to go further afield you can also rent a car, bicycles and motorbikes. Yet all this is only 65 km from Heraklion.